How to start with E-Maps? Starting with E-Maps is easy. Find below the steps to install E-Maps. E-Maps is an add-on for Excel. To start E-Maps from the Windows taskbar, just start Excel. After starting Excel and opening a new or existing workbook, you can find E-Maps as a ribbon tab in Excel. By clicking on Show/Hide Map or Activate, the following window will appear. At the purchase of E-Maps in the webshop, you received a username (usually your email) and an activation key. Enter this data in the window and select Activate. For evaluation of E-Maps, tick the box for the 14 day trial and fill out your email address. 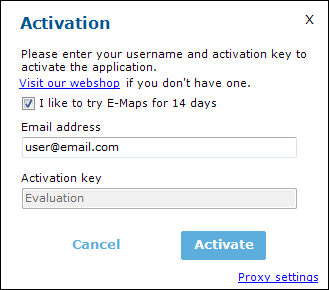 After evaluation, you can use the same installation of E-Maps and activate with your activation key. In case your network connection has proxy settings, please select the Proxy Settings option. You can now start using E-Maps.